A car had to be lifted out of the way of a bus onto a truck after it rolled out of its parking space into the path of oncoming traffic in Edinburgh. The incident happened just before 1330 GMT in Chambers Street after its handbrake was left off. 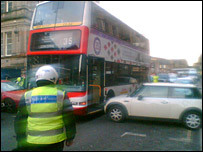 It caused several cars including a Lothian Bus to wait until it was removed. An Edinburgh Council tow truck was called out and it was removed by 1430 GMT on Monday.